I have been selling things now and then on ebay for years. It has been a great way for me to clean out my house of all the junk we have acquired over the years. Much of it really isn't "junk," it is just in the way, if you know what I mean. So today I am cleaning out some things and if you are interested in seeing what I have listed, you can go to 3kids2love and see all the items I am putting on eBay today. Now if I could only get my husband to sell the workout equipment in the garage that is collecting dust (and has been for 5 years). I swear, why we ever bought that fitness equipment I will never know. I guess the road to hell is paved with good intentions. By the way, my eBay name is "3kids2love" so if you are on eBay and you want to see what I have going on, just take a look. I don't know that I will have anything you want, but you never know. I am not a regular seller on eBay, but maybe I should be considering all the crap I have lying around here that we never use. 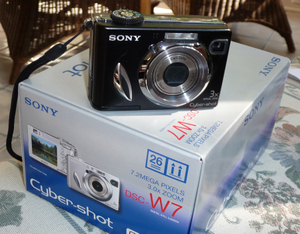 Sony CyberShot DSC-W7. It's a great little camera. You can find it on eBay HERE. Geez! That was the url from hell, so I made it easy by clicking the blue "HERE" above. Oops, it's brown in the original post - I think. I have a reserve price of $280.00. It sells for over $500 retail. Being that I only used it twice and kept it in the box for the rest of the time, it is practically new. As I list a few other things today, I will post them in this blog. Sound good? Oh, and I only sell to residents of the United States. I've tried that International shipping and it is ridiculous paperwork. I'd rather eat dirt. I am sure some of you can relate. So sorry to my international readers who love this cybershot or anything else I have listed on eBay. I hope you understand. With my US shipments, all I have to do is slap on a label and give it to the mail-person in my driveway. Easy. I like easy. 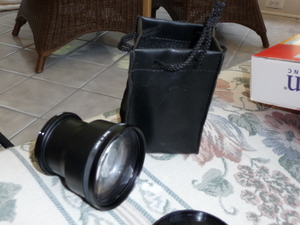 This is a cool little lens. I never used it. I cannot, however, find the original box it came in although I am sure it is around here somewhere. It is in perfect condition. I think it will work with the Sony that I am selling as well, and I know for sure it will work with certain Canon digital cameras. Regardless, you can purchase an adapter for just a few bucks and it should then fit your camera nicely. Check it out HERE on eBay in my listings. I have a reserve price of $40.00. It sells for over $75.00 retail. I've never used it. Promise! I will look real hard for the box. I think I must have been having one of those days where I was anxious to get it out of the box and threw the box away. Must have been one of those impulse buying kind of days. By the way, if you have any questions, feel free to ask them here in the comment section, or via eBay. Doesn't matter. They all come to little ol' me.